Italy are uninspiring in attack but do enough in the end to defeat a spirited Finland side in Udine, beginning their Group J campaign with three points. 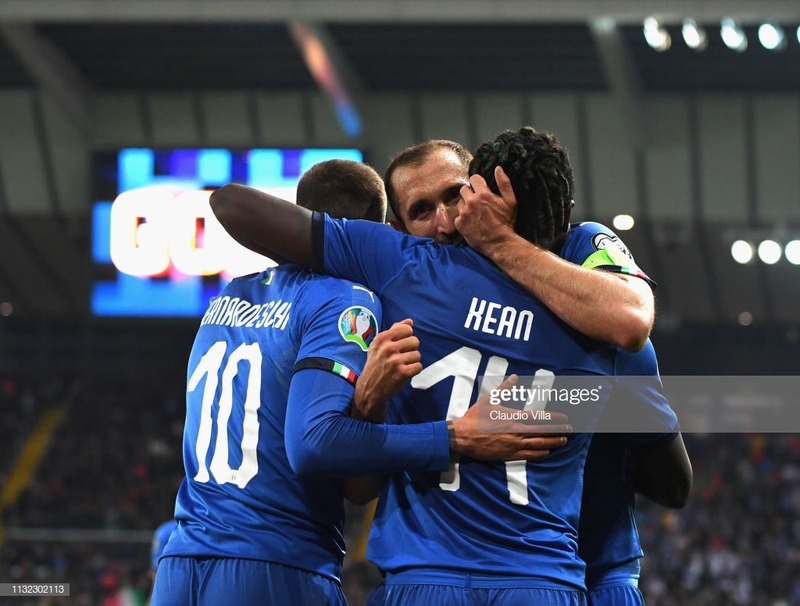 Italy were the victors over Finland in their inaugural match of Group J in UEFA EURO 2020 qualifying but the Italians were made to work hard for victory against a plucky Finnish side that have real aspirations of qualification too. Italy invited their guests to the north-eastern Italian comune of Udine in less than spectacular form. A failure to reach the World Cup and a disappointing UEFA Nations League campaign has Italian football at it's lowest point in many years and with staggeringly, only four wins in their last fourteen, it was important that La Nazionale began their qualifying campaign with victory. Finland, in contrast, made the trip to this region with real confidence, despite a dismal record against the Italians. With only three defeats in their last sixteen games and a successful UEFA Nations League campaign under their belt, this nation is on the rise again and will have no fear in this group, fancying their chances of at least finishing in second place. It was clear from the first whistle at the Dacia Arena that Italy were keen to right the wrongs of the last twelve months or so as the Azzurri started at a blistering pace, opening the scoring in just seven minutes. A set-piece cleared only as far as the onrushing Nicolo Barella, his ferocious volley deflecting en route into the net, earning a first international goal for the Cagliari midfielder. Teemu Pukki is in tremendous form for club side Norwich City and it was his good work out on the right in maintaining possession that allowed sixty-eight times capped Tim Sparv to unleash the first shot in anger for the visitors, unfortunately for the FC Midtjylland veteran, he pulled his effort wide. Moise Kean of Juventus is a player quickly attracting headlines as he begins his journey in the world of football and he provided much of the energy in the first half of Italy, his attempt at digging out a cross early in the first half came to Cristiano Piccini at the far post, only for the Valencia defender to fail in his connection and find side netting only. Finland, while not seeing much of the ball, were consistent with their good build-up play, asking questions of the experienced Italian defence. Robin Lod, currently plying his trade in the second tier of Spanish football, was the beneficiary of this good play but couldn't find the target with two of his efforts in the first half. Italy's build-up play was not an issue but as has been the case in recent times, the final product was missing. Federico Bernardeschi had a shot off target while Kean fired wide after a poor punch from Lukas Hradecky in the Finland goal presented the opportunity for the striker at the close of the first half. The home side continued to control the play in the second half but it was quickly becoming apparent just why they have been scoring so few in recent matches. Ciro Immobile looked to be in relatively early in the second half only for the attack to be snuffed out by Hradecky Italy struggled to add to their lead. Poor decision making and the lack of a killer final ball was the continued theme. As the match ticked onto the hour, it was Finland who looked the more inventive as Italy experienced a lull. Pukki lurked with intent and the chance they were waiting for soon followed as the white shirts charged forward, Lod found Pukki perfectly in the middle but the striker could only poke it wide when he really should've levelled the score. The longer the match stayed at 1-0, the Finns grew in confidence, pushing more men forward but the Italians would finally wrap up the game in the final fifteen minutes with Immobile charging forward, playing in Kean to score his first-ever international goal. An Italian prodigy and perhaps a new star born in this night in the Friuli region. The Italians could relax a little after that and the jubilant fans were almost sent into overdrive as the 36 year-old Fabio Quagliarella, the top scorer in Serie A and just onto the pitch, came ever so close with a header which forced Hradecky into a good save and denied a fairytale moment for the Sampdoria hitman and he came ever closer not long after, a wicked shot crashing against the crossbar, desperately unlucky not to find his goal. The final whistle brought the end to a tricky assignment for the home side and while they didn't quite pass it with flying colours, due mostly to their lack of threat in the final third for most of the match, it was a welcome return to winning ways and it brings back much optimism for what is a very winnable group. It has been well documented that Italy have struggled as of late, a side known for their strong defensive work rate but also their dangerous attack and midfield have been blunted on that front in the last couple of years. The alarm bells certainly rang with their World Cup disappointment and inability to score a home goal vs. Sweden in the play-off for that tournament. The performance was encouraging, Italy controlled the game and looked more cohesive as a team than they have in some time. The lack of spark at times was still evident but with players such as the in-form Federico Chiesa and Lorenzo Insigne missing, perhaps the fizz in the attack will return, but this was a good first step on the road to recovery. Finland deserve all the credit for their performance and will feel that the 2-0 scoreline was flattering for the home side. Finland displayed the attributes that have them in such good form as of late, getting forward when they could and looking to cause problems. Their build-up play was excellent and while they only fashioned one really good opportunity that Pukki should've taken, there was a threatening feeling any time they crossed the half-way line. This game was a free shot for the Finnish, they wouldn't have bargained for any points and anything gained would've been a bonus. The crucial games are yet to come and whatever happens in this group, they also have a UEFA Nations League play-off spot to fall back on after they topped their group in 2018. Moise Kean was undoubtedly the best player on the park for the Italians. The youngster, born in the year 2000, made his competitive debut and was a real breath of fresh air. He injected energy, pace and dynamism into the side and was the source of anything good created in the attack. He got the goal his performance deserved at the end of the match, running in behind the defence and latching on to Immobile's pass before an ice-cool finish beyond Hradecky. There is every reason to believe Kean will be a star for the national side going forward. Fabio Quagliarella was only on the pitch for the final ten minutes but this cult hero of Italian football immediately involved himself in the action, his header well saved before hitting the bar in the final minutes. It is fair to say he did more than Immobile in the entire game and has put himself in contention for a start vs. Liechtenstein on Tuesday night. As for Finland, Pukki and Lod worked hard throughout the night, closing down and trying to create respectively. Lod had a few chances himself and the Sporting Gijon man can be happy with his performance. He also provided the inch-perfect pass for Pukki in the second half that saw the striker stab wide when he really should've equalized for the visitors. Finland's dismal record against the Italians did not improve on this night, their only ever victory remains their extra-time win at the 1912 Olympic Games. Italy have won ten of the other eleven meetings, conceding just twice. History has a way of repeating itself though, even with the troubles Italy have faced recently and on this night in Udine in 2019, it was the Italians that came out on top once again, ensuring the perfect start to their qualifying campaign and injecting new hope and belief into a side that had witnessed all of that dissipate in the last two years.